This was really just a novella, a sort of long short story I wrote once after watching several period dramas. I decided to try my hand at writing romantic historical fiction, although this is not a true history in any part of our world. 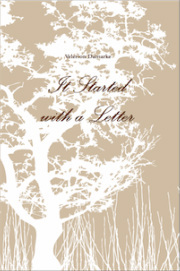 A lonely young woman finds a letter mistakenly dropped on the street near her home. When she reads it, she's moved by the emotions expressed by the man who wrote it, and she begins to fixate on the sender. When she sends him a letter of her own after sending the letter on its way to its intended recipient, he's less than pleased about his letter being read by other than its intended, which is a woman who he intends to marry. Things get more complicated when the writer apologizes, and they begin a correspondence, which her best friend, and the writer's intended wife learn of and don't agree with.